We stopped by a church and looked at the graveyard. There were several graves of people who had died as a result of An Gorta Mór ('the Great Hunger' - the famine of 1845-1849). 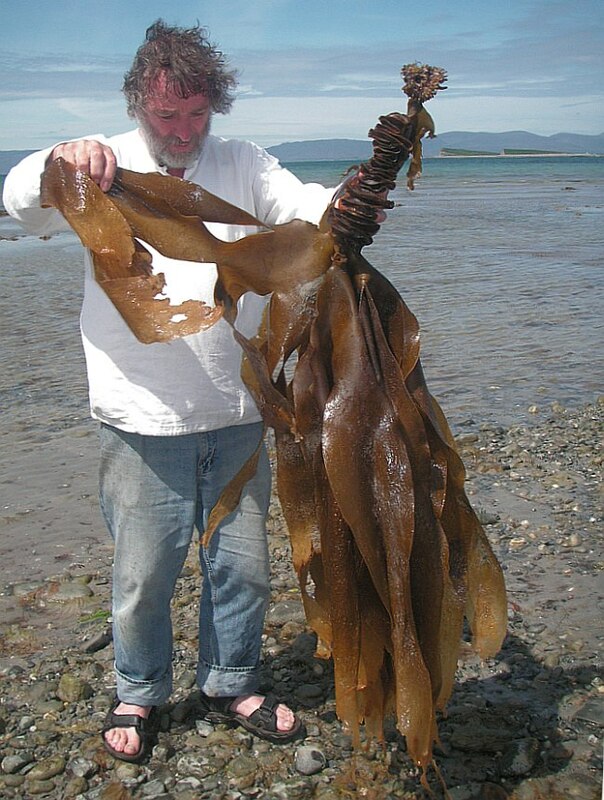 Also a mass grave for the victims of drowning after an outing on Clew Bay. We were intrigued by the use of mirrors and tiles in small mosaics that adorned some of the headstones. The sky ahead of the road way out west to Achill Island seemed to get brighter and brighter. The effect of the sun reflecting off the sea - especially the Atlantic, for some reason - is always exhilarating for me, and to see this liquid sunshine wrapping around headlands and swilling into sheltered bays represented a life-affirming visual feast. Yet, here again, were instances of abandoned fields and remnant villages from the famine. Eking a livelihood from the bog at any time would be a challenge. The effects of the sea and the wind in shaping the landscape through erosion are clear to see. We stopped at a beach where Grampus had been instrumental in successfully restoring sand-dunes through the use of locally-produced hazel hurdles and chestnut stake fencing. Gille got close and personal with seaweed, shells and stones, and was particularly excited about kelp. 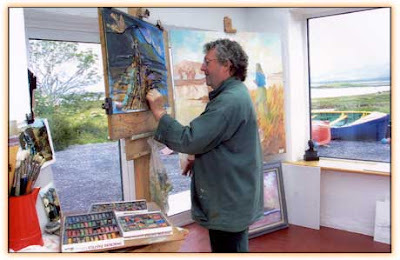 Before arriving on Achill by crossing the Michael Davitt Bridge, we stopped at Dánlann Yawl, the studio and gallery of artist Seosamh Ó Dálaighon on the Curraun peninsula. 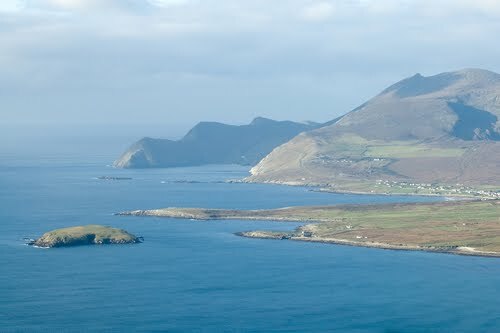 (The people of Curraun consider themselves Achill people, and refer to this area as being in Achill.) In addition to his studio, gallery and coffee-shop, Seosamh Ó Dálaigh runs a residential School of Painting. Seosamh works in oils, watercolours and pastels and is a shameless name-dropper and self-publicist. He seems to have done well for himself, if the prices for his courses and for his work are anything to go by. He is also a keen sailor with experience of sailing the traditional west of Ireland boats, including the dánlann yawl, after which he has named his gallery. There was quite a volume of passing tourist traffic, even in mid-June (before the school holidays), suggesting that Achill is a popular destination. 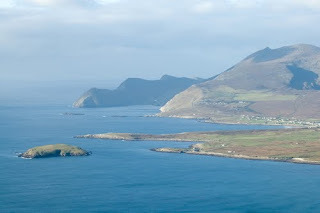 The road to and around Achill Island is known as the Atlantic Drive. It is absolutely beathtaking, and the quality of light illustrated in this photo is no exaggeration. Sky, land and sea evaporate in an azure blue. It was where the iconic Irish artist Paul Henry came to paint, featuring the people, their whitewashed cottages and piles of turf. The built landscape has changed since then. The traditional vernacular houses have been replaced with utilitarian system-built houses and holiday developments which pay no regard for the island's natural features. Once again I found this was a challenging thought. As a visitor exploring cultural landscapes, I expected to see Paul Henry's Achill of the early 20th Century, but found the 21st Century. Who am I to expect people to live in the conditions of 100 years' ago? I would have loved to have stayed long enough to explore more of these features through walking and drawing, but we planned to gather wild seafood (shellfish and seaweed) to cook and eat for supper, before staying at our overnight hostel accommodation in Westport. Time and tide were against this plan for gathering seafood, however, and Martin made a round of a supermarket instead for our breakfast, and we ate out in a restaurant in Westport. Martin and I stayed on after the meal in the centre of the town and enjoyed traditional music in one of the many busy pubs. The musicians were generous enough to allow me to sing before we left for the hostel. The next morning I had time to go back into the town to buy a present for Trish. I wanted - and found - some contemporary hand-crafted jewellery based on Celtic motifs. I think I could have gone into any town in Ireland and found similar work. Ireland, more than Scotland, seems to have been able to contemporise its traditions without them appearing naff tourist-tat. Even when it is tat, it seems to be done tongue-in-cheek with a heavy dose of ironic humour. However, as I noticed with the Brigit's Garden website, cultural authenticity is not easily conveyed through the media. Perhaps this is because those engaged in advertising and PR might not be so sensitive to this authenticity as they attempt to elicit a positive response from their target audiences. Returning to the hostel, I decided it was time to divest ourselves of the piece of driftwood that we'd taken over to Clare Island and back again, so it became a feature in the hostel's garden border. We met Jerry Hawe from Sylviron and drove to the Prospect Hall estate to look at local woodland management and particularly the heritage value of broadleaves woodland. We started the tour at a disused lime kiln, which for some reason surprised me because it was so similar to lime kilns around my home. We saw new tree planting, learnt a lot about woodland management and also saw the ruins of a pre-famine village/hamlet and ‘lasheen’ (children’s graveyard on unconsecrated ground). I was very taken by the Tamworth Sandyback pigs that were happily living and clearing the undergrowth of a forest area. Once again we were exposed to what I can only describe as 'cultural layering'; where settlements and tracks have been overgrown and overplanted, then cleared and replaced with more planting and building as new ideas and techniques take root (pun intended!). Jerry was very tolerant of my questions as I delved into his vast bank of knowledge.We had a picnic lunch in the woods before continuing our journey to Castlebar. Jerry took us to see the end-of-course show of artists at Castlebar College. It was in an impressive hall, and a colleague of his had the best situation - the wall behind the stage. I was surprised by the work. Most of it was painting and most of it was unselfconsciously modernist. There were no installation works and no artist's statements. I enjoyed it. It stimulated an interesting discussion between Martin, Jerry and I about contemporary art. We parted company from Jerry and went to the far side of Castlebar to Turlough Park House, the National Museum of Ireland – Country Life. It is home to the national collection of objects representing the traditional way of life in Ireland since 1850. In the grounds was a reconstruction of a lime-washed wattle & daub cottage, complete with details about its construction. The museum buildings were a very interesting juxtaposition of country house and modern glass and steel. The collections were well displayed and seemed to underline everything we had learnt on the trip, placing it into a national political and social context. It provided a fitting plenary session to all that we had experienced.